Note: This course fulfills part of the requirements for the YogaFit HealthCare 900-hour certification, as well as the YogaFit 300‐hour teacher training. 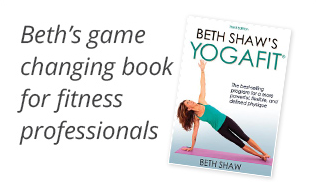 The one-day YogaFit Props training is included in this four-day workshop. Bolster, Blocks, 10Ft. Restorative Strap or Seniors Strap , Eye Pillow, Blanket, 2 Bath Towels, Hand Towels.